Biriyani. Luscious, scrumptious, succulent, spicy, sensational biriyani. This trademark Muslim delicacy happens to be my all-time, year round favourite. There are varied types of biriyani- chicken, mutton, prawn, fish and unfortunately vegetarian also which I really don’t care about. Now the bestest Biriyani according to me is chicken. Obviously. And the bestest biriyani you can get in Chennai is in Royapettah. The bestest biriyani maker there is Rahamathullah whose biriyani oozes richness and all things not so healthy. The bestest accompaniement for biriyani is the usual kathirika kootu (aubergine spicy peppery thing) and thayir pachadi (curd and onion mixed thing) and for added extra exciting eating experience a tennsy weensy piece of fried chicken won’t hurt. Now biriyani is not meant to be treated casually. It should be treated with utmost respect since it ccupies a very high position in the food chart. Atleast for me. In Tamil Nadu however Muslims are identified by their biriyani. Indian non-Muslims love their Muslim friends. This love increases as Eid draws closer. Eid festivities begin with ordering or making of biriyani. Weddings are incomplete without it. 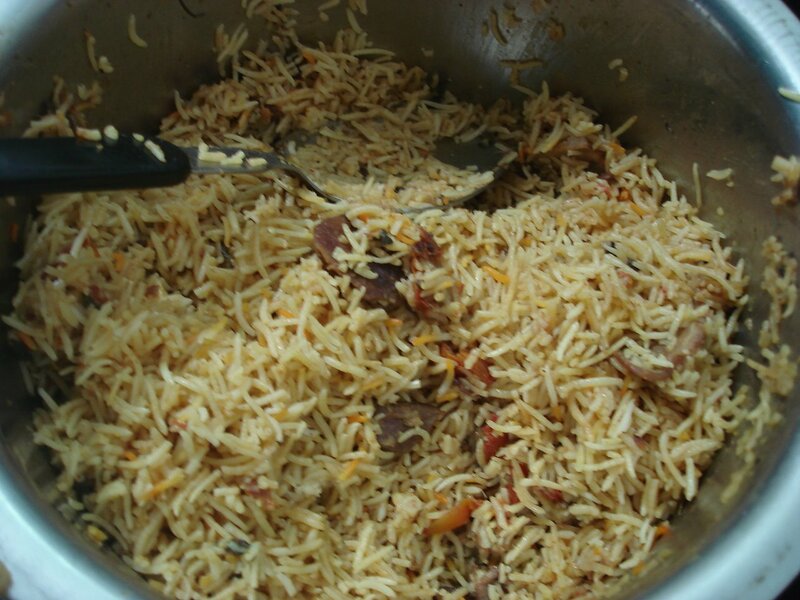 The success of a wedding depends on whether the biriyani was a hit or a miss. Good food is remembered for a long time. Bad biriyani is never forgotten. The very smell of freshly prepared biriyani is heaven sent. Only Allah can think of something that smells so utterly tempting. The satisfaction of eating good biriyani? I have no words to explain it. Now bad biriyani.. thats an entirely differen issue. I have tasted the WORST of biriyani. Under-cooked, over cooked, bland, spiceless, unappetising, makes you want to cry biriyani, you name it, I’v had it! Another speciality is bread sweet which has bread (duh! ), khoa, cashews and some other unidentifiable stuff. But the yum factor is ten on a scale of 1 to 10! Definitely not for weight watchers though. But once you’ve had it you’ll never want to stop. Many people I know eat Biriyani just because “it is there:. I eat it because for me it is “BIRIYANI!!! Aaaah!!”. When you eat it you should enjoy it and appericiate every mouthfull and thank Allah for giving us something that is so damn fine! → What would YOU do…? I think the pic which u hav uploaded for biryani is vermisili(semiya)!! @ jeeya umm no.. its briyani.. i shold kmow.. i ate after i took the pic!! hey zarine.. advance happy new year! !